Vinyl cove base by Johnsonite is the contractor's choice for finishing off a room. This vinyl baseboard comes in .08 inch and .125 inch thick strips. Johnsonite wall base is easy to apply with Cove Base Adhesive or Step Tape. Find vinyl cove base in easy to work with 4 foot strips or special order coils (non-returnable) in 120 foot or 100 foot lengths. Over 30 popular Johnsonite colors as well as non-stock colors (non-returnable) are available. Pre-molded vinyl base outside and inside corners add a nice finished touch. Johnsonite cove base is now available in both coved (with a toe) and straight (toeless) base. Color: 36 stock cove base molding colors available. Looking for Rubber Material Wall Base? Find Rubber Cove Base HERE. 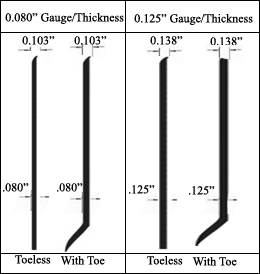 Find your specfic height, length, and gauge (.080" or .125" thick) in the chart or product listings below. Colors are listed within each product page. With Toe or Toeless options are listed within each product page. 2.5" Height .080" .125" .080" .125" .080" .125" .080" .125"
4" Height .080" .125" .080" .125" .080" .125" .080" .125"
6" Height .080" .125" .080" .125" .080" .125" .080" .125"